Anglers use Lake Wanahoo in Nebraska. A five-year study by researchers at Nebraska examined angler habits and lake use at water bodies across the state. 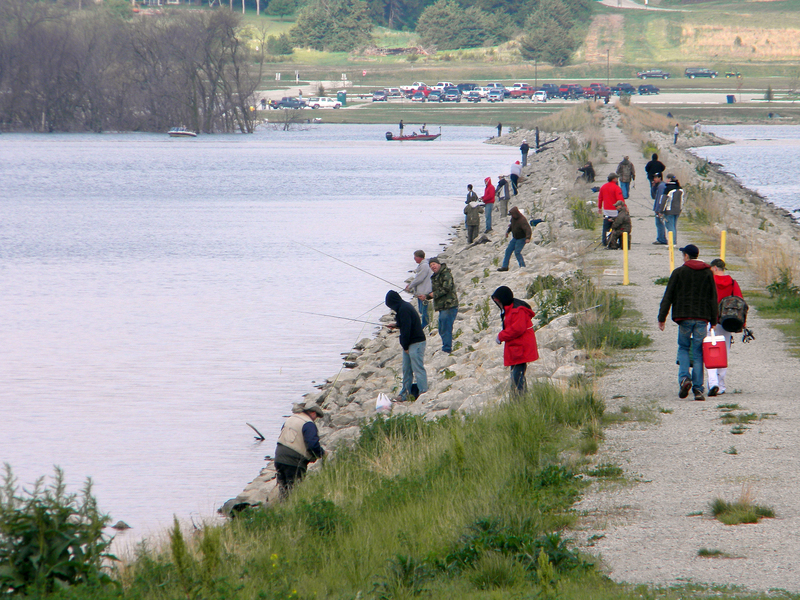 Management decisions for Nebraska lakes and reservoirs are often made at a local level with the assumption that anglers will simply move to the next-nearest lake to fish. However, a new five-year study by University of Nebraska–Lincoln researchers shows that decisions made by anglers are more complicated and that local water-management decisions can add unintended stresses on regional waterways. "If you can't launch your boat at one lake, you may go to another," said Mark Kaemingk, lead author of the study and research assistant professor with the Nebraska Cooperative Fish and Wildlife Research Unit in the School of Natural Resources. "But you also may not fish at all, or you may drive further to find a comparable experience." The final decision of each angler will affect local, regional and statewide resources. More anglers on a smaller body of water will increase fishing pressure; more boats on a lake would also increase gasoline pollutants in water. "We need to be aware and manage for those effects," Kaemingk said. "It's a delicate balance to manage for human needs and the demand on the resource." A more realistic approach is to manage by water type and by angler type at a regional scale to reduce resource stressors, he said. "In water management, we've tended to think locally and have not scaled up. But it turns out we can't apply a blanket approach to angler and fish management,” Kaemingk said. 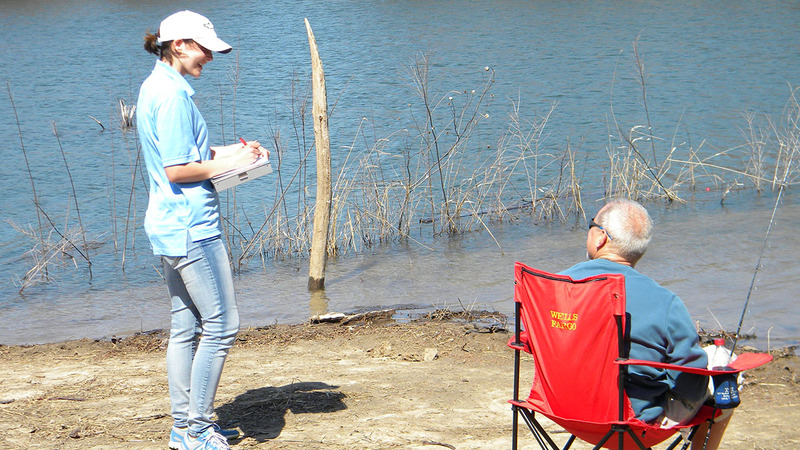 Alexis Fedele, a graduate student in the School of Natural Resources, conducts a survey with an angler at Prairie Queen Lake. The research project, published in the Journal of Applied Ecology, has provided the researchers with necessary statistical evidence on the habits of anglers. Details, for example, examine why some anglers are fishing from the bank of Pawnee Lake, while others are trolling from a boat on Lake McConaughy. Those at Pawnee are likely to catch more fish, but fewer species, to fish alone, and to fish for shorter periods of time. Those on Lake McConaughy will catch fewer fish but a wider diversity of species, fish in groups of two or more, and stay for up to eight hours. In gathering the statistical evidence, Kaemingk said the project has also unearthed a slew of questions the team will pursue in future research. Those include what role lake size plays in whether anglers interact with the resource, but also what happens if the largest body of water in a state is nearest to the largest population center. They also are collecting data on whether management decisions have impacts on lakes in states that border Nebraska. "We are excited to learn more about angler behavior at multiple spatial and temporal scales," Kaemingk said. "Anglers are a critical component of a fishery, and we still have a lot to learn about them."